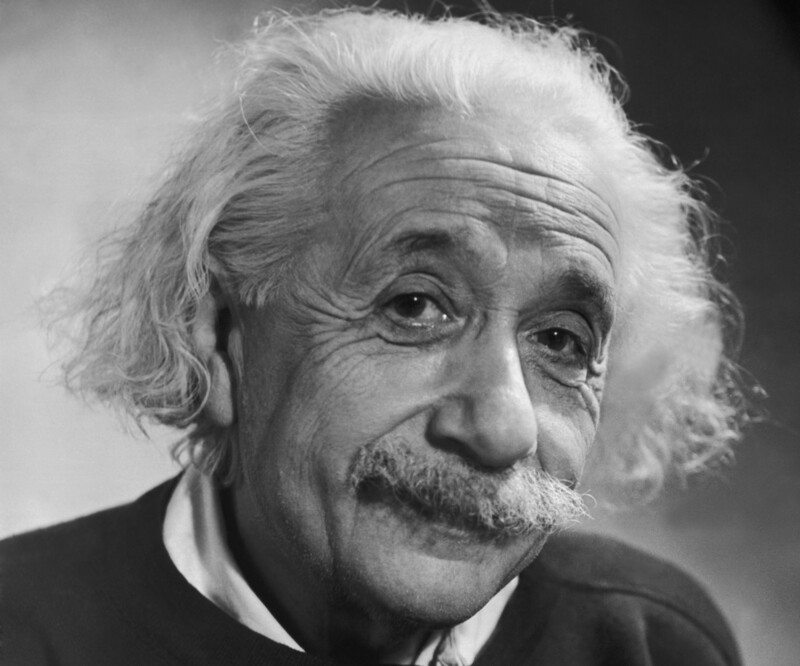 Albert Einstein is one of the most famous physicists to have ever lived. In 1915 Albert Einstein predicted that when objects with an extremely dense mass collided with each other in space they would cause ripples in space-time. Yesterday, a century later, scientists announced that they have detected these ripples (also called gravitational waves) for the first time. But wait – first let’s discuss what space-time is. First proposed by Einstein’s teacher Hermann Minkowski in 1908, space-time is the relationship between three physical dimensions (up/down, left/right, forward/back) and time. Einstein improved and expanded this idea in his theory of general relativity. He deduced that time cannot be separate from the 3 physical dimensions we’re used to, and that time passes differently depending on the speed an object is travelling when it is observed. Confused? Let’s have an example. Imagine that you are on a spaceship travelling extremely fast, maybe half the speed of light (that would be more than 539 million kilometres per hour). You have a ball, which you throw directly up in the air so that it bounces off the ceiling and lands on the floor of your spaceship. It’s gone straight up and then straight down again. Right? But if I was some distance outside your spaceship, stationary and watching you do this (let’s imagine it’s a transparent spaceship) I would see something different. As I watched your spaceship speed past I’d see you throw the ball and watch it land but because the spaceship is moving along while the ball is travelling towards the ceiling, I would see the ball travel upwards in a diagonal line. It would bounce off the ceiling and then move downwards in a diagonal line because the spaceship is still travelling along while the ball falls down. Are you still with me? Good. The path you saw the ball take, and the path I saw the ball take, are very different. Because of the speed of your spaceship I saw the ball travel not only in a different direction but also a greater distance taking a longer time. Who’s right? We both are. This is called time dilation, where the time on a spaceship moving quickly passes passes more slowly than it does on a stationary object. This is the essence of Einstein’s theory of general relativity – the observed rate at which time passes depends on the object’s velocity (speed) in relation to the observer. Take a deep breath – we’ve done the tricky bit. A 2-dimensional representation of Earth causing space-time to dip. (Image: Wikipedia). A simple way of picturing space-time is to imagine it as a rubber sheet (bear with me, this’ll make more sense in a moment!). Objects with mass cause space-time to curve, just as a bowling ball would cause a dip in a rubber sheet. Although this analogy is flawed because it doesn’t account for the fourth dimension of time, it’ll do for our purposes. And now we can get back to the idea of gravitational waves. Two immense black holes, each approximately 30 times the mass of our sun but occupying a space only about 150 kilometres across, were orbiting each other. They pulled each other in until they collided and merged, like two soap bubbles joining together. In the twenty thousandths of a second that this collision took, vast quantities of matter (equivalent to three of our sun) were converted into energy. 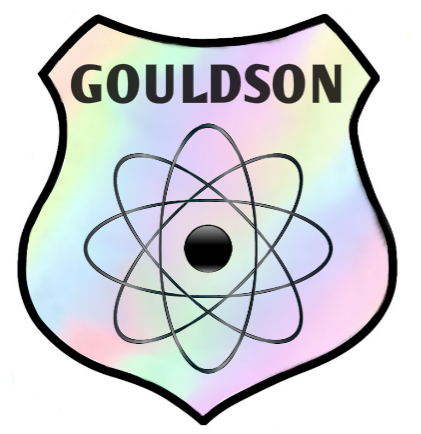 This caused a huge shockwave that travelled outwards from the collision, causing the fabric of space-time to ripple. These ripples are called gravitational waves and after travelling for a billion years they were detected by scientists at the Laser Interferometer Gravitational-Wave Observatory (LIGO) in the United States; first at the site in Washington state and then again just seven thousandths of a second later at the site in Louisiana, roughly 3200 kilometres away. 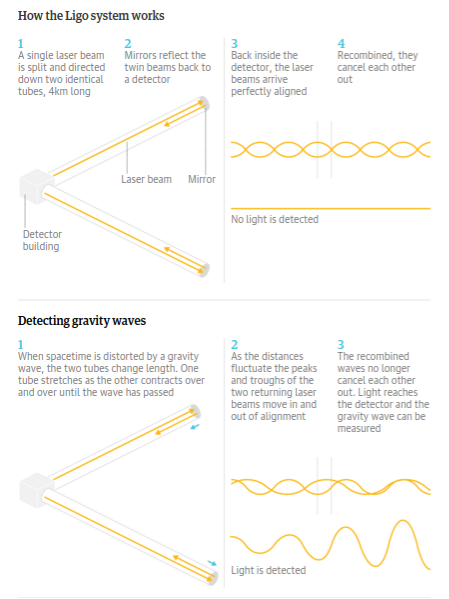 How LIGO detected the gravitational waves. (Image: LIGO Scientific Collaboration, Scientific American). “We will literally be able to see the big bang. Using electromagnetic waves we cannot see further back than 400,000 years after the big bang. The early universe was opaque to light. It is not opaque to gravitational waves. It is completely transparent. So literally, by gathering gravitational waves we will be able to see exactly what happened at the initial singularity. The most weird and wonderful prediction of Einstein’s theory was that everything came out of a single event: the big bang singularity. And we will be able to see what happened“. (Image: First Dog On The Moon, The Guardian newspaper). Pingback: Science, explained simply | Is there intelligent life in our universe?